I’m a sucker for most kinds of chili, especially when the weather is cold and I’m craving that comforting bowl of rich goodness. Generally, I like meat of some sort in my chili, and in addition to my signature Holy Mole Turkey Chili, I make and enjoy all kinds of and meat and bean chilis. 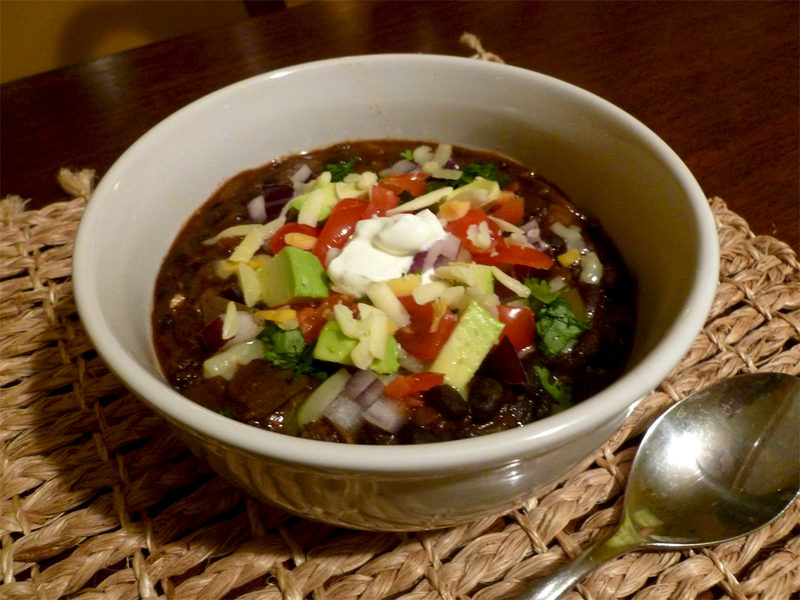 In the last couple of weeks we’ve been taking a more healthy road around here as you may have noticed, and the other day I remembered a recipe I used to make long ago for a rather delicious, and quite frugal, black bean chili. This chili is completely vegetarian (I think it might actually qualify as vegan (! ), even), and the toppings for it can be customized to your desires. I like to stick with the veggie and cheese variety of toppings to let the beans shine through. 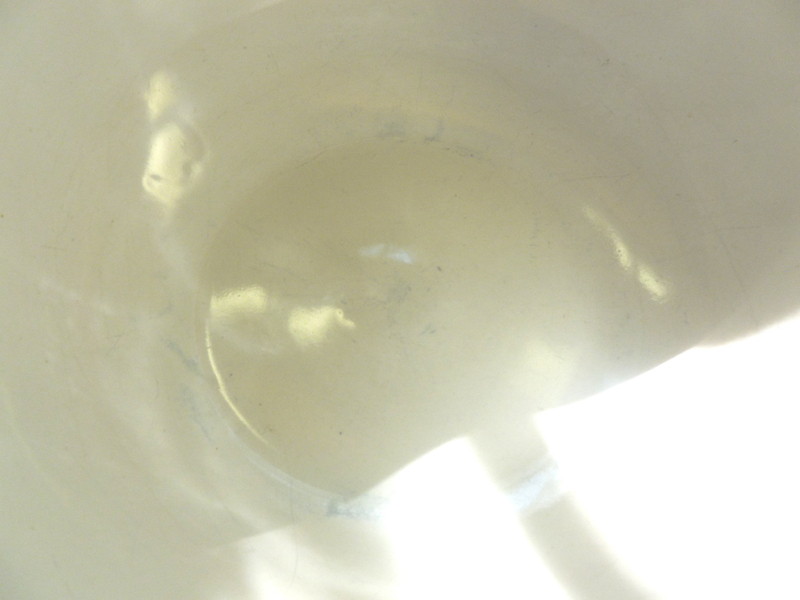 Exhibit A: This is what you DON”T do… put black beans to soak in a white mixing bowl! Place the beans in a large pot with enough water to cover by 3 inches and soak them overnight. (See exhibit A of what not to soak them in!) Drain the beans and rinse, then return them to the pot and cover with another 3 inches of water. 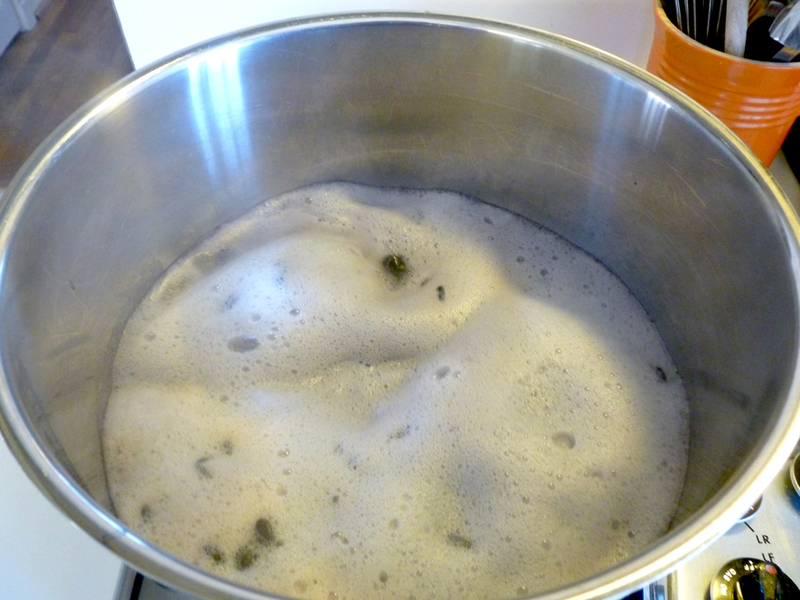 Bring them to a boil, skim off the foam (see exhibit B), reduce to simmer and cook until tender, about 2 hours. Drain well. Exhibit B: Be sure to skim off all of that nasty foam when the beans first start to boil, otherwise you’ll have cooked beans with a film on them. I DID remember this! Heat the oil in a heavy dutch oven or a stock pot over medium heat. Add the bell peppers, onion and garlic, and cook until tender, stirring occasionally, about 10 minutes. Add the cumin, chili powder, basil, oregano and cayenne to the pot and cook the spices, stirring constantly, about 2 more minutes. Add the beans, 3 cups water, canned chilies, tomato sauce, tomato paste and stir, then bring to a boil. Reduce the heat to low, cover and cook for about 45 minutes until the chili is thick, stirring occasionally. Add the lime juice and season to taste with kosher salt and freshly ground black pepper. Serve with your favorite garnishes. 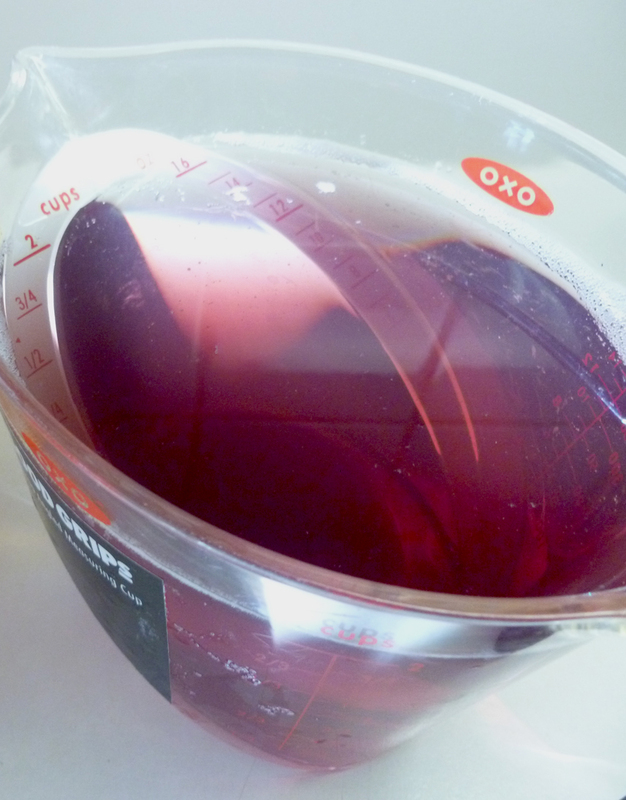 Just look at the color of that soaking liquid. Purple socks, anyone? Note: If you need to naturally dye anything, you could use the soaking water from the black beans to do it, resulting in a nice purpley blue color! How’s that for waste not? And you can give me love me on Facebook, too! Just click that little box on the right hand side of my home page to “Like” me there, please! This entry was posted in Chili, Food and tagged Black Bean Chili, Black Beans, frugal, Heathy meals, peppers, Vegan, Vegetarian, Vegetarian Black Bean Chili by bitsandbreadcrumbs. Bookmark the permalink. Gotta be! 🙂 I love to mix in the garnishes, too, John, and also dip into the whole thing and eat it with tortilla chips…but am trying to wean myself off of that particular tortilla chip habit. So glad you like the recipe! I love everything about this dish – the chili, the garnish, the fact that it´s made with pulses (which we eat a lot of here). Not sure if we can get black beans, but I am sure I could adapt! This sounds really tasty. I’ve been trying to add more beans to my diet. Hmmm…I think I better try this! I hope you will try it, Gretchen. It’s a great way to eat your beans! Hi Betsy – I *love* beans. I often find that popping open a can of them is easiest because they require so much forward planning otherwise, but they’re fantastic. I really love vegetarian meals – I think the belief that many people have that you have to eat meat with every meal is just … bizarre. I like feeling sometimes that I’m chowing down on something completely meat-free. 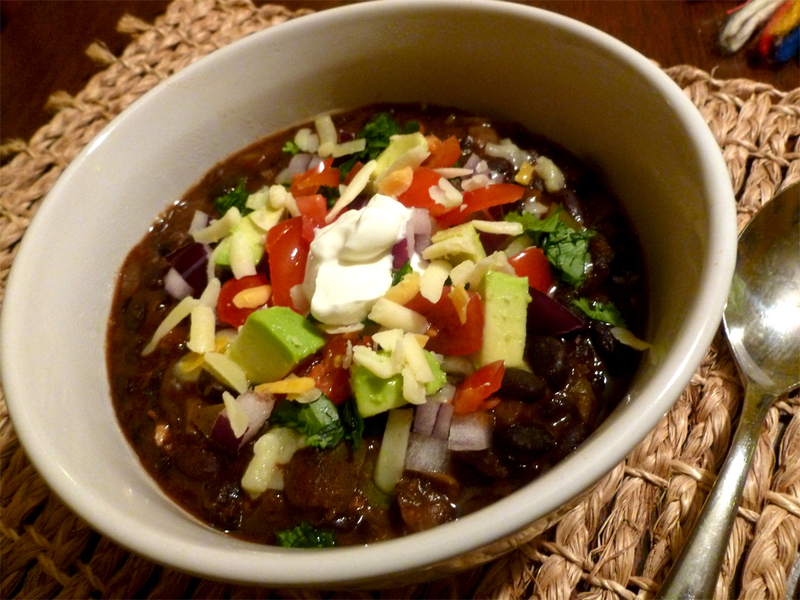 You chili looks wonderful – so rich and deep coloured and the topping looks great too! Hi Charles – like you, I usually just pop open a can of beans, especially now that we can so easily get them minimally processed and with no salt—they’re just so darn convenient. Then every great once in awhile I go and cook some dried beans “from scratch” and realize how much tastier they are and better textured than the canned ones and I chastise myself for being a bit lazy (and more often than not lacking in forward planning)! 🙂 Thanks for your compliments and I hope you’ll give this a try sometime….you could probably make it with canned and rinsed black beans and it would work just fine, too! This looks so pretty in the bowl, Betsy. I once won an award for the worst chili at a work-sponsored cook-off. They tasted my black bean chili last, getting the stuff that was cooling and sticking to the bottom of the pot — I have never made it since! Thank you, Sharyn. That’s a terrible story and no wonder you haven’t made it since. It’s true, black bean chili isn’t at its best after sitting in a pot for too long becoming glue. Which raises a good point…the stirring of this chili while it’s cooking is quite necessary to insure that it doesn’t stick to your pot and make clean up really difficult! Okay, I just laughed out loud at that! Yum! It is always good having recipes like this. I try not to eat meat every day, so I will definitely try this. Hi there cupcakes! Thanks for visiting and let me know what you think if you try this out! Another awesome black bean recipe! I love chili and I’m trying to do some vegetarian meals so this is a perfect idea. Sounds and looks tremendously flavorful! Thanks Tia! I hope you’ll give it a try since you like black beans. It really has a different flavor from the usual black bean forward recipes. I like that even though this is vegetarian, it looks really rich. Thanks for sharing your Holy Mole Turkey recipe with me also — now I can’t decide which to try first! You’ve also inspired me to buy some Monterey Jack cheese….I always forget to pick some up but it goes so well with chili. You’re spot on, Barb. It is really rich for a straight up bean and veg dish. Of course the garnish takes it over the top. I wish we’d had some Monterey jack on hand…I think it adds more to it than the cheddar, but both are good, it’s just the the jack is creamier…so less of a need for sour cream if you’re counting calories! I don’t care how many days it take to prepare. Love take time and I’m always interested in finding alternatives for my addiction to meat. Thanks for sharing! I’m sure that’s the kind of meal where you wouldn’t notice that there wasn’t any meat. It looks really delicious Betsy and I’m sure that is a great dinner for a cold winter’s night. Thank you, Kay! I used to not be a big fan of beans until I realized they could be so versatile and that it’s all about how you prepare them. Plain beans don’t do much for me, but in chili’s, stews and cassoulet…now that’s worth eating! I always like the challenge of a vegetarian chili! This looks and sounds delicious. I agree, Yummy, really good vegetarian chili can be a challenge. Most of the time it’s too bland for me. This chili isn’t overly spicy, but it has a nicely balanced savory flavor which is really enhanced by the garnishes. Add some tortilla chips and you’ve almost got vegetarian nachos! Grab me a spoon, no never mind a big tortilla chip so I can dig in. I am now craving this dish. Why do I always read your blog late at night….now I’m hungry? Tortilla chips are definitely the way to go here, Bam, you’ve got the right idea! I have to watch myself because all I want to do is scoop and eat and the next thing I know I’ve gone through half a bag. What a great compliment, thank you, and I’m glad I made you hungry! Hi Betsy, traveling has put me way behind reading your posts. You have been busy making some great sounding dishes. A bowl of this chili will be great when we are back in cold country. And you savory bread pudding…yum. Hi Karen, I know it’s hard to keep up, isn’t it? Even if you’re not traveling! 🙂 I appreciate you stopping by and your nice comments. Both these dishes are good for chilly nights, and I think we still have a few ahead before Spring arrives. So glad you’re having a great trip and safe travels to you! That looks really tasty, Betsy, and I was going to say that this sounds like a perfect crock pot recipe, but WHAT THE HECK IS THAT FOAM? How disgusting…I’ve never seen any other bean do this? The end result looks like a satisfying and healthy meal. I love meals like this…now I just need things to cool down a little, at the moment it’s a whole lot of salads getting a look in. I like to have a few meatless meals a week and this looks so filling and good I agree everyone would love this!! I also like to make dishes that I know will hold up good for a few days worth of yummy leftovers!! Thank you Linda! 🙂 We are trying to do that on a more regular basis for health reasons and also because veggies just taste good. I do enjoy meat, too, but think we get into overdrive during the holidays….at least around here! Thanks Choc Chip Uru…that’s definitely the best way to enjoy this chili! Black beans are one of my favorites! I learned to love them when visiting a friend in Costa Rica. Just in case you haven’t figured this out already… a quick soak with some white vinegar will remove the stains in your bowl from the black beans. It also helps to use a microfiber cloth for the tougher spots. BTW, this trick works on stains in your crock pot too! Oh, no! So sorry about that…and thanks for the catch. It’s 10 cloves of garlic, you could get by with 6 if they’re large. Thanks for alerting me and I hope this doesn’t mess you up! I guessed and used about 6 of varying sizes (mostly large) and it is tasting really delicious! So I think it will be OK! Can’t wait for my husband to taste it! THANKS! Oh, good, whew! I used to make this with 6 cloves, but upped it to 10 because I really like garlic! I think how much garlic is really a matter of personal taste. 🙂 So glad you like it!